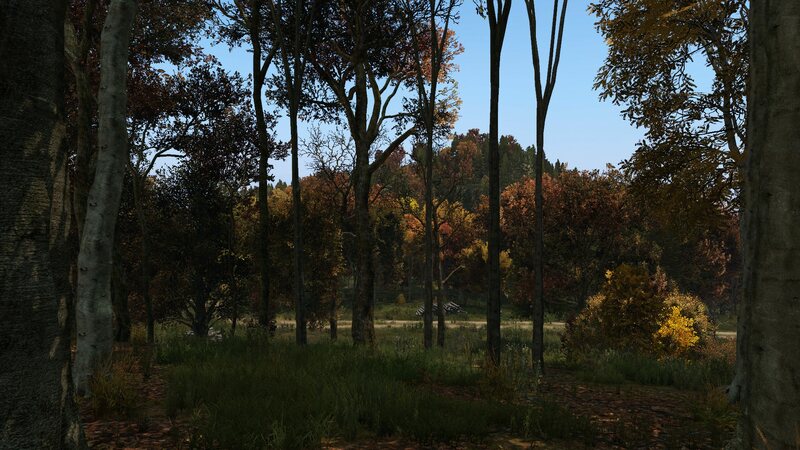 Following the 0.63 Experimental release last week we are back with our Status Report. Today, Eugen gives us an update on the state of development, while Viktor and Adam from the animation team show us what they've been up to for the past couple of weeks. Our Map Designer Adam demonstrates changes to the weather system and we get some insights into the audio progress by our Sound Designer Filip. And of course we close with our community highlights, let's dive into it! the Experimental release is behind us, but the work does not stop here. 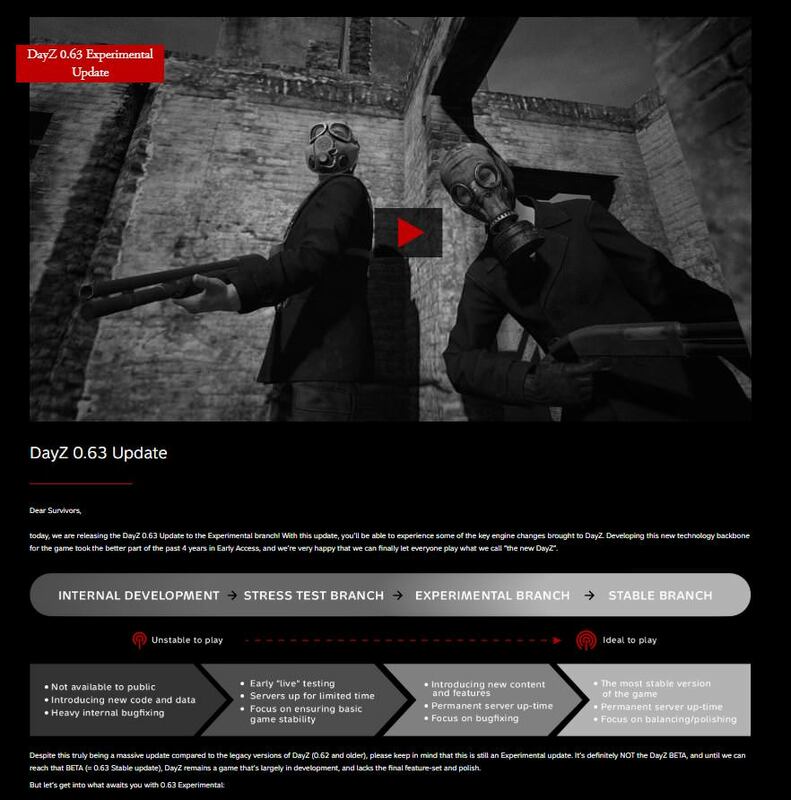 So I would like to look at the issues present, troubling the community playing this version and also talk about the internal development that has happened and features you'll be seeing very soon on the Stress Test and Experimental branch. We kept both of the branches active to make sure we don't break Experimental too often and have features coming into it with more polish. While 0.63 is heavy on new technology, we know it's quite light on content. But you will be able to enjoy a lot of the new stuff in the upcoming weeks. The issues that take longest to iron out are related to the stability of client and server, and problems that would end up interrupting your play sessions for various reasons. From locked characters, to server kicks or just unexpected crashes to desktop. Things are getting better, but there is more to be done in this regard and we continue to monitor the situation and apply fixes to make sure we eliminate this as soon as possible. 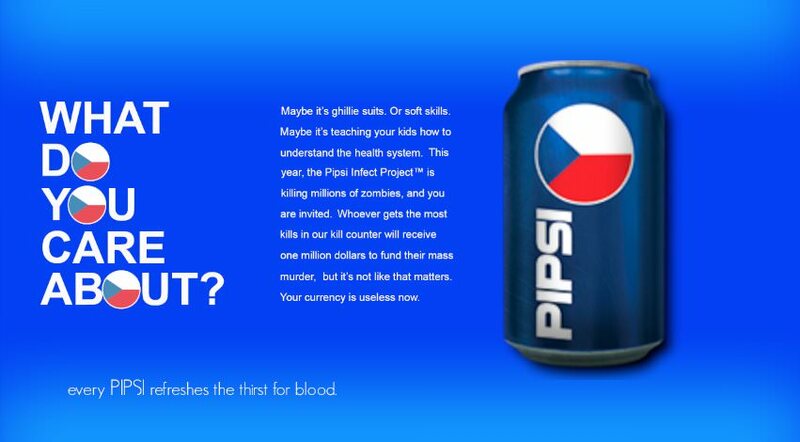 We know its not there yet and its our top priority. 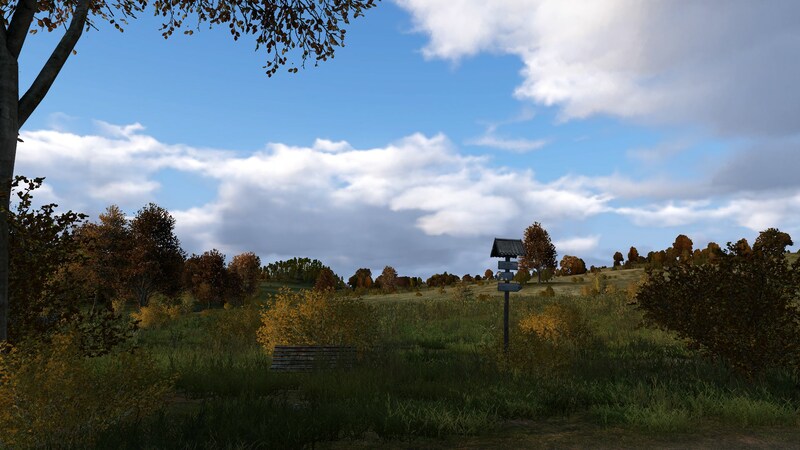 We should also talk about our plan to make the Experimental servers available to server owners currently running their communities. Sadly this had to be slightly postponed due to changes necessary for GDPR and memory leaks wreaking havoc on stability and performance. These seem to be fixed as of today, so very soon you will be able to switch over and enjoy the updated version with your fellow community members on your own terms. In terms of development, we are currently moving along quite nicely with only small delays in features planned out internally. The benefits of the new technology are already showing themselves in the pace of implementation. We are also looking into possible solutions to issues that currently cause these delays and make sure we deliver. Let's go over the current state of development and features themselves. So you might be asking yourself when these things hit Stress Test and Experimental branches. We plan to switch over a bunch of these very soon, and you can expect to have these available in batches over the coming weeks. However, we want to aim for at least unconscious state to be finished in different edge cases. As of now, there are still small issues with ladder/water unconscious state interactions that are not ready for the Stress Test, but this week we should see them fixed and as such moved to the Stress Test branch alongside many other new features and content. Hello everyone, today I would like to share with you in this short update what the animation team has been working on for the past weeks and what is going on at the moment. Obviously, the player character is important to us, so we continue improving its behaviour and what it can do. At the moment, we are revisiting some of the animations and improving them, or replacing them with better ones. This includes melee combat and its attacks. There have been some animation changes to better represent which item is the player attacking with, like a new sprint-attack with the baseball bat. Also, a lot of work has been put into finger poses so that the character is holding various items the best way it can. Some of the recent animation additions include the new IZH43 animation set, and some gestures like nodding head, shrug, and "OK". One of the more significant improvements to player locomotion is the ability to jump over obstacles. The feature is still work-in-progress, as well as the animations, but the character is now able to overcome small objects that are in his way by jumping over them. We are now in the process of adding all the animation variations for different directions and items in hands. At the same time, our programmer is working on the climbing for players and soon, we will start implementing animations for it. As we also started tidying up some animations and features, there is an ongoing work on player actions. This includes polishing of existing animations, some graph tweaks, but also some new animations to better visualize what the character is doing. Our Technical Animator Adam will share more details on what was happening over the past weeks regarding various animation improvements related to these actions. Make sure to check out the gifs for the baseball bat attack, cutting down bushes and, jumping. For the past couple of weeks, I have been hard at work revamping, tweaking, and creating animations for many various actions. User actions are the backbone of the game, and as such, they require thought out implementation; what items can they be done with? What stances are they realistic in? Should the character be able to move during the action? All of these play a huge role in their realization, concept, and execution. I’ve implemented animations for on back actions (mainly important ones; drinking, eating, etc), tweaked some action animations to be faster or slower and cutting out unnecessary parts, depending on which type of action. I’ve also created and implemented animations for placing heavy items (barrels, generators, etc) and smaller items (bear traps, mines, etc), and I’ve also revamped the horticulture action animations, such as cutting down a tree with a two-handed axe, or one-handed hatchet, cutting down bushes, and getting bark from trees with knives or machetes. As a part of these actions, I also implemented some smaller QoL (quality of life) representative action animations for viewing compass and viewing the map to properly convey what the player is currently doing. We’re in “full steam ahead” mode with the actions and their corresponding animations, and every week we’re working on new actions and polishing the animations for the ones we already have! Regarding performance improvements we have reached a point, where we have decided to remove the ability to disable volumetric clouds on the client side - this change will take an effect once revamp of graphical options is finalized. 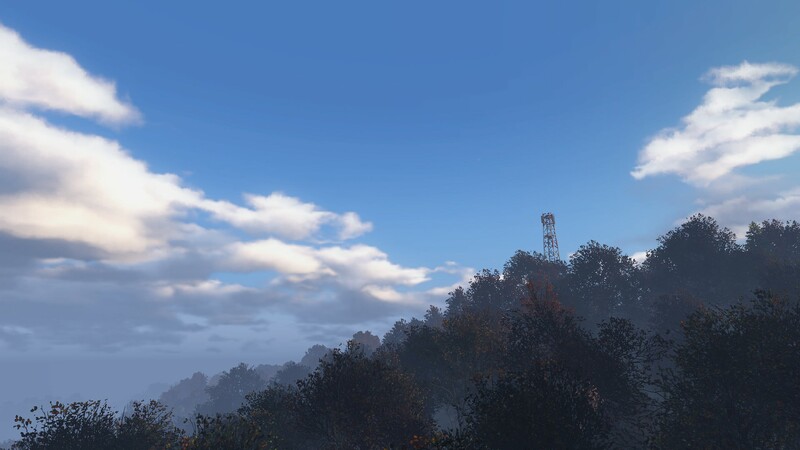 There have been major changes in the cloud configuration, which are mainly aimed to make the clouds more visible and distinct from the skybox background. We improved the interaction of fog (in distance and height) and volumetric clouds, so that clouds should blend better with the horizon when it is foggy. The silver lining effect of clouds has been greatly boosted during the early to late sunrises and sunsets. The movement speed of clouds during windy conditions has been reduced and we've brought additional improvements to the skybox background textures (overcast-dependent) along with some minor tweaks to the global lighting config to support the changes in the skybox and volumetric clouds. Closeup raindrops are much more visible now. Closeup rain drops are more visible during the night-time around light sources. 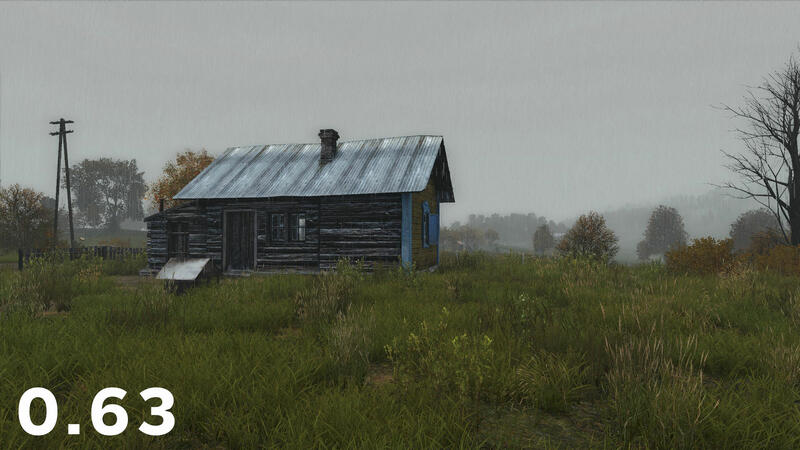 Both clouds and rain changes should be available to test once the next major Stress Test branch update happens. We are looking forward to your feedback on these improvements! The latest sound feature we started to work on are voice sounds for the character. So far we've implemented breathing when the character runs out of stamina, the sounds for holding breath while aiming in iron sight mode. and hit reactions when the character takes damage. We plan to add more sounds to create a more immersive character representation. Some of the sounds will be connected to animations, like grunts while jumping, or picking up heavy items, or sounds to emphasize melee combat. Others should be connected to character states, like the feeling of hunger or representation of disease. Hello everyone, the last two weeks were both really exciting and busy for us. The release of Experimental was a big milestone all of us have been looking forward to for a long time. Even though we are aware of some issues on Experimental, we are happy, that you finally can play 0.63 almost whenever you want. 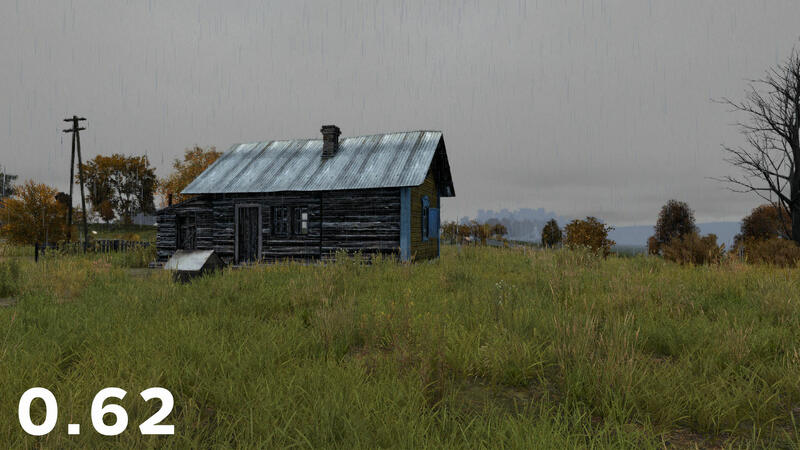 If you haven't done it already, check our Highlight page[dayz.com] featuring all the good stuff from this update! Another big event was our Community Live Stream. We knew that just a day after the release of 0.63 Experimental, there were going to be a lot of questions. Unfortunately, after announcing the stream, our beloved Eugen got sick and it was clear, that he wouldn’t be able to attend the stream. We still wanted to hold on to our promise and decided to take it as an opportunity to do our first Community Live Stream. We introduced new members of our Community team, opened Boydy's package (thanks again!) and tried to answer as many questions as possible even without the devs. Do you need a new wallpaper? 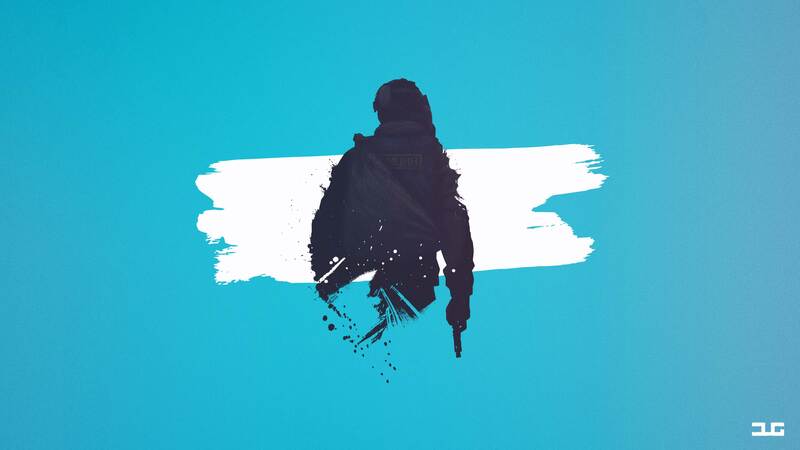 I have a cool one for you made by ChernoMerlo from the DrDesync’s screenshot. And here is another one. I have it on my desktop already! Shane O’Sullivan sent me a really interesting piece of a newspaper. It is named Bohemian Post and he made it by himself. 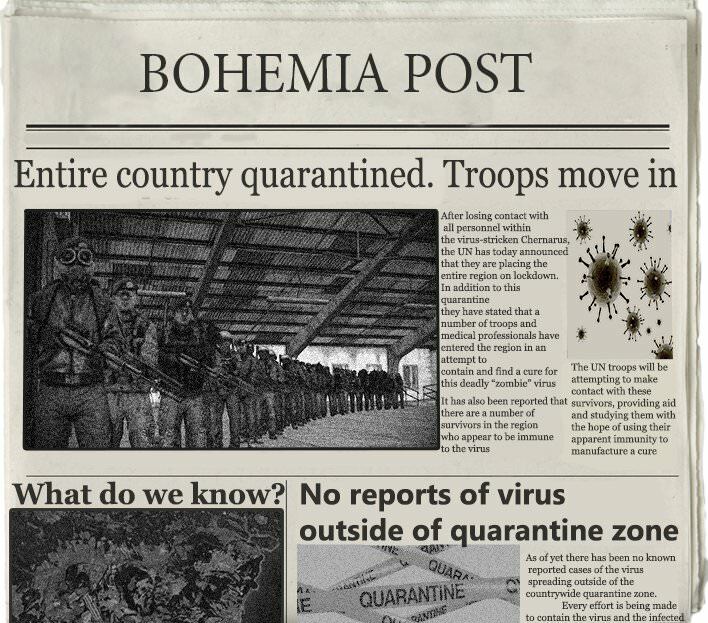 There you can find news about the infection spreading across Chernarus. 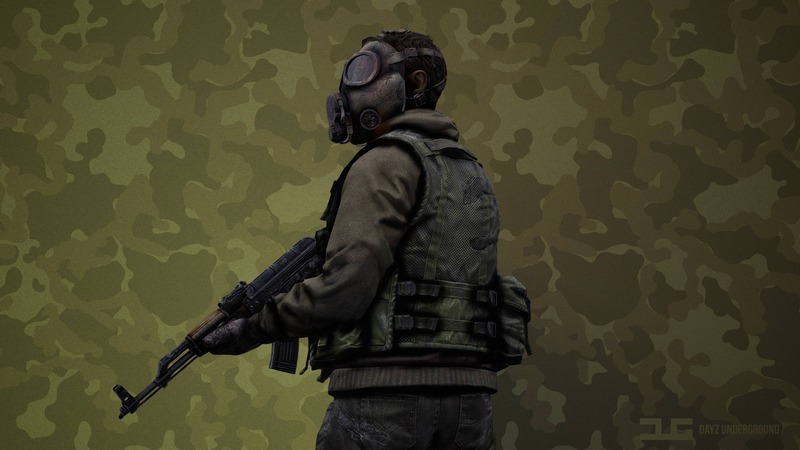 Now I want to show you a special project by DayZUnderground called #TwitterPlay. 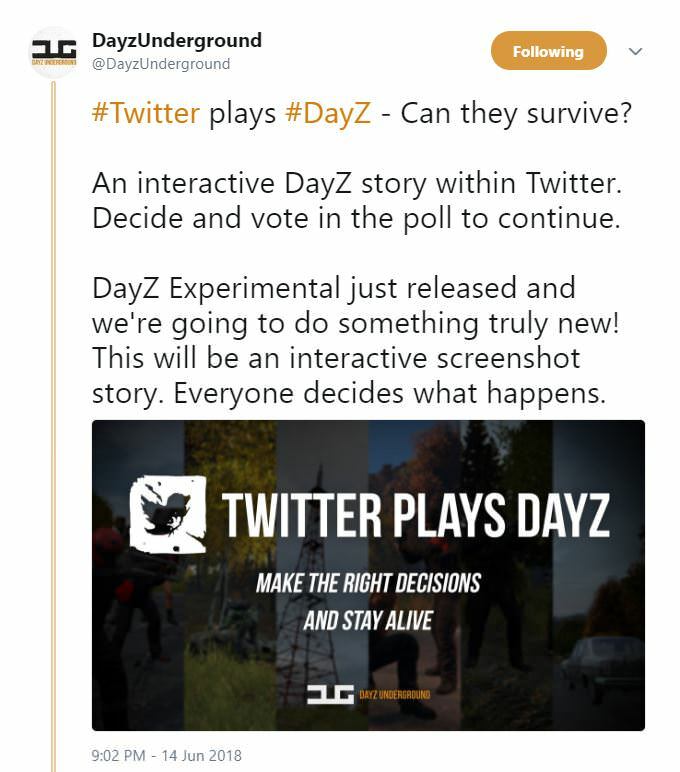 It is an interactive DayZ story within Twitter and it is updated daily. People are making a story through their votes in polls and they can decide what happened with a survivor, about whom the story is. It is a really nice idea and we love it! Join the story and make your own part! You can find the latest part HERE. 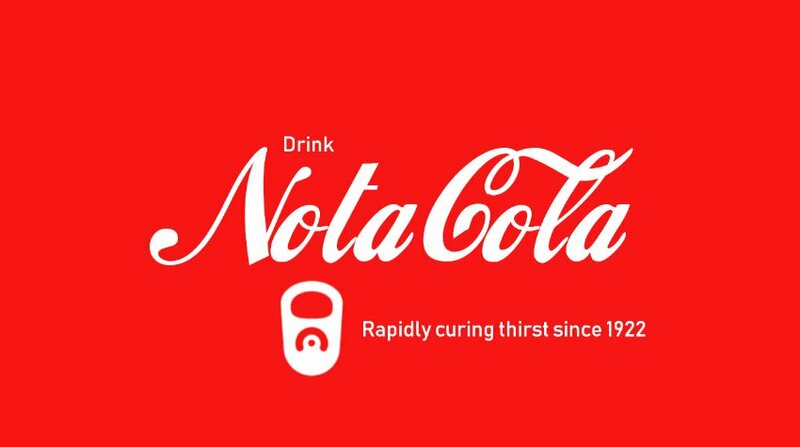 Cage, who we met personally at Pax East, sent us his custom advertisement inspired by our Nota Cola and Pipsi drinks and they are pretty creative. And the last two pieces of content are videos. The first one is a cinematic trailer about surviving in Chernarus and it is sick. Everyone from the dev team loves it, this is amazing work by HookOak Productions! The last short clip is made by our loyal member NeuroticEUROtic and he is sharing his feelings when Experimental was near. Time for a riddle. The riddle from the latest Status Report wasn't so hard, the rock is situated on the North-West of Svetlojarsk above the train yard. Who guessed it right? If you know where is it, tweet it to our official Twitter account with #DayZriddleTime and you can be on the wall of fame next time. Thank you guys for your content and I hope you will share your creation with us next time!